The Three Tenors and Friends Sing Christmas! 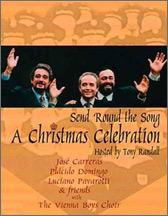 Placido Domingo, Lucianno Pavarotti, Jose Carreras, Mirella Freni, The Vienna Boys Choir, and other greats from opera sing the most famous Christmas carols. Filmed on location in the snow covered Austrian Alps and by a cozy fireside, this celebration in song is a holiday hit for every format! With Tony Randall.